Wow, the Midwest Horse Fair is over. What a long weekend. I just want to share some of the special and funny moments from my time there. I brought my horse Jackson with me. On Sunday morning, we were walking around the parking lots, just going slow and relaxed. Jackson had his blanket on to help his coat stay flat. I hear a car drive behind us, not unusual as it was a parking lot, but then the next thing I heard was, “Is that JACKSON!?”. I turn around with a puzzled look on my face. There was a girl, maybe 16 years old. I told her that, yes, this was Jackson. She came up and told me she watches all of my videos on YouTube and has always wanted to meet Jackson. What a cool experience! On Friday, Jackson and I wandered around and I was able to show off doing tricks and liberty on the ground in front of the coliseum. Jackson was doing his best rears ever, going really high and walking forward quite a ways. He bowed and laydown and stuck to me like glue even though there were no fences anywhere! Even though we didn’t perform super well on Sunday, I know how fantastic Jackson can be. He is super motivated when there is a crowd watching and he does a good job performing when he is feeling good! On Saturday, I had my hair down quite a bit. Jackson was stalled right next to the Friesians. One of the ladies came up to me and wanted to let me know that she and her friends were guessing that I had to be part Friesian with such long dark hair. What a nice thing to say! 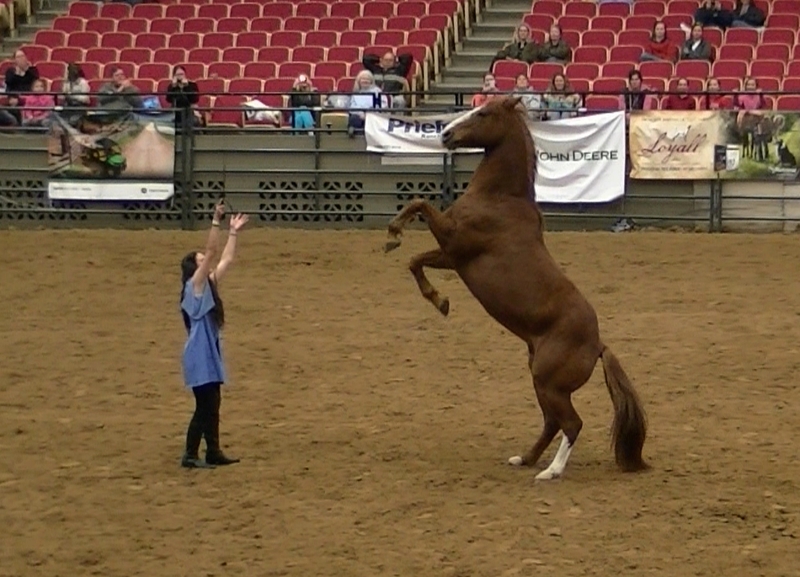 Many times throughout the weekend, I got to talk to people about how I train horses to do tricks. Many were interested in the gentler methods. I continue to hope to be able to inspire people everywhere! This.Is.So.Cool! :O I’m amazed! Jackson is beautiful and it’s so thrilling watching him at liberty. ^.^ He’s clicker trained? Thanks! Yes, Jackson is clicker trained. Keep an eye on my blog for a summer liberty challenge for all horse owners! I’m enjoying your photos and videos very much, but alas! I don’t own a horse nor do I ride. I almost took western lessons last year though. 😉 I love horses so much!